Fundi Education offers student-focused presentations and teacher training sessions to incorporate Black history into the classroom. Life of African-Canadian Pioneers In Ontario (Grade 3 - Communities in Canada, 1780 - 1850). Imagine traveling to a new country by foot or by boat for days, even weeks. When you get there, you encounter the difficulties of building a life for you and your family similar to thousands of other immigrants, but you face even greater hardships because of your race. Students will learn about the experiences of early African Canadian settlers, what obstacles Black pioneers faced, how they overcame them, and how Blacks contributed to developing the country of Canada. African-Canadians in New France and British North America (Grade 7 - New France and British North America, 1713 - 1800; Canada, 1800 - 1850: Conflict and Challenges). Blacks have played important roles in the early development of what is now Canada. They were interpreters, slaves, farmers, builders, soldiers, and educators. Students will learn about the longevity of Black settlements in New France and British North America, their contributions and experiences. Blacks in Early Canada (Grade 8 - Creating Canada, 1850 - 1890; Canada, 1890 - 1914: A Changing Society). 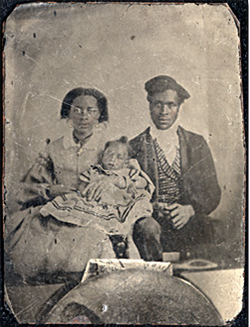 Canada’s Black population increased dramatically in the 1850’s when American slavery laws forced escaping slaves to flee further north for safety. Students will examine the experiences of fugitive American slaves and free Blacks as they settled across the Canadian landscape during the mid-1800’s to 1920’s. Black Inventors (General). This workshop will create a greater awareness of the many things we use in our everyday lives that were invented by Black men and women. The Black Experience in 20th Century Canada (Grade 10 History). The 20th century was a time of great change and social unrest - the Industrial Revolution, World Wars One and Two, and the challenging of individual rights - learn how many Blacks were affected by and contributed to these changes. Magnificent Mali: A Medieval African Society (Grade 4 - Early Societies, 3000 BCE - 1500 BCE). The Mali Empire, once one of the wealthiest empires on earth and the second most far-reaching kingdom in West Africa, thrived during the Medieval period. Students will explore aspects of Mali’s society ranging from trade, rulers, geography, and daily life through a variety of interactive exercises. Celebrating Freedom in Canada: Understanding Emancipation Day Celebrations (Grade 2: Traditions and Celebrations/ Grade 3: Early Settlement in Upper Canada/ Grade 7: British North America; Conflict and Change/ Grade 8: Development of Western Canada; Canada: A Changing Society/ Grade 10 History). In the 19th century, Emancipation Day was the premiere social event for African Canadians from all walks of life. Every August First since 1834, African Canadians have celebrated freedom from slavery throughout British colonies, including Canada. Based on the research for my two books, Talking About Freedom: Celebrating Emancipation Day in Canada (2012) and Emancipation Day: Celebrating Freedom in Canada (2010), students will learn about the origins and features of Emancipation Day commemorations, develop an understanding of how it has evolved over time, and how Emancipation Day celebrations have impacted local communities in Ontario and across Canada. Program Cost: contact Natasha Henry for details. For more information or to book programs contact Natasha Henry at fundi_edu@hotmail.com. Educators will gain valuable content knowledge and learn inquiry-based approaches to teaching Black history across the Ontario curriculum. These workshops will support teachers in enhancing their knowledge and application of the six historical thinking concepts and embedding the principles of inclusion, diversity, and equity and into their teaching practice through the inclusion of the African Canadian experience. These training sessions will demonstrate how Black Canadian history doesn't have to be a stand-alone unit or a focus only during Black History Month. Participants will leave each workshop with the knowledge, skills, and tools to bring intriguing stories of African Canadians to life. Specifically tailored to suit your needs. INTERESTED IN BRINGING THESE WORKSHOPS TO YOUR CLASS, SCHOOL, OR SCHOOL BOARD? Contact Natasha Henry at fundi_edu@hotmail.com.